The Frog Pose is a powerful groin opener of the adductor muscles and can aid you in digestion and cramps, both menstrual and from the stomach. It is similar to the pose known as Mandukasana in traditional yoga. I love the above quote from Bernie, because so much of our yoga practice is trying to force ourselves into poses instead of patiently allowing the opening of the joints, by de-efforting and releasing. Being aware of our effort is the nature of the Yin practice. Mindfully allowing gravity and the breath to allow us to go deeper into the pose, instead of making it a wrestling match with our bodies! To understand how Yin Yoga differs from a traditional yoga practice, click here. The Frog Pose is especially difficult to me, as you can tell in the photos below. I resist doing this pose as much and I can, which is precisely why I need to do it! The mindful Yin practice of this pose works deeply into the hips, the shoulders and even into the lower back. This is a mild backbend in the full expression of the pose, however, because my goins are so tight, I don't get much lower back compression! (Refer to 2nd photo below). Sarah Powers, my Yin Yoga teacher does not teach the Frog Pose, and I am not sure why. Despite my own love-hate relationship to this pose, I believe it is worthwhile to include it in a well-rounded Yin Yoga practice. For me, variety is indeed the spice of life, and when you tire of the Dragonfly Poses, this one adds a variation to your Liver, Kidney and Spleen meridian work of the inner thigh. To begin the pose, come to all fours of the Table Top Pose. Ever so slowly, and testing your body, slide your knees apart, keeping the knees in line with the hips, as shown below. Find your first edge. This is the place where your body begins to feel only mildly uncomfortable. Deeply belly breathe into this space. Send your breath to the areas that are tugging, along the inner thighs. Keep your feet wide and in line with your knees. If the pressure on your inner thighs is too severe in the initial stages, accept where you are, and you can try bringing your feet together. This is known as the Tadpole Pose, a variation of this pose. I do not show this variation, but it is easy to do. It looks exactly like the first photo, but instead, slowly bring your toes to touch one another. If your first edge eases, go ahead to your second edge, spending a moment here, until you can reach your full expression of this pose. You may have to come down on your elbows, or if you are really open, you can place your arms out straight over your head, as your chest reaches for the ground. The photo below, is as far as I can get. You can now see the mild back compression in the mini-backbend. If you stay up on your forearms, drop your belly and allow it to hang, here is where the relief of cramps comes into play! If you are doing this properly, it is easy to feel the release in your stomach and how this pose would aid in digestion and cramp relief. It might be easy for you to place your chest and/or stomach on the ground, and your arms over your head, but then the focus will be solely on the groins. This is OK, if this is your intent for the pose. You may want to play between aiding your stomach's release, and turning your attention solely to the inner thighs and groin. There is no set rule for the pose - do it as your own heart is led. This is the beauty of a home yoga practice! You can also try the variation of the Tadpole Pose, even after you have reached the full expression of the pose, by experimenting with bringing your toes together once again. 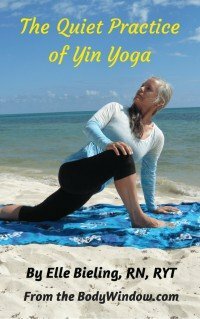 If you can't keep your knees in line with your hips, you can also try to bring your hips forward a bit, which will release some pressure as well. This is OK too. The secret to the Frog Pose, is not trying to keep going lower with your hips through your effort, but in keeping your knees in line with your hips to allow gravity to exert its full effect, along with breathwork to deeply release. When you have reached your second edge, try to stay longer here without even attempting to go lower. The effect of gravity will definitely deepen your experience without your moving at all! Try to hold the pose(s) for 3-5 minutes. Just continue to be mindful of your practice of this pose, to keep it a dance and not a wrestling match with your body! Energize the Liver, Kidney and Spleen meridians through the release of the adductor muscles of the inner thighs. May you continue on your journey of self-discovery when you practice the Tadpole and the Frog Pose! May you always find healing of your body-mind-soul when you de-effort, find stillness and surrender to what is!